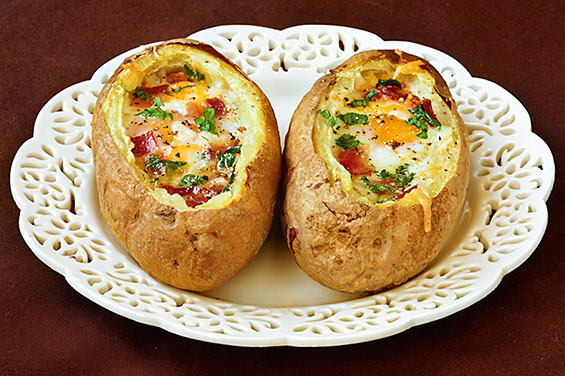 1.Lay the first baked potato on its side, and use a knife to carefully cut off the top third of the potato. With a spoon, hollow out the middle of the potato to make a "bowl", leaving the potato as thick or thin as you'd like. (Just remember, the more room you leave, the more room for eggs, bacon and cheese!) Repeat with the second potato. 2.Place 1/2 tablespoon of butter in the middle of each bowl. Then gently break an egg into each bowl, careful not to break the yolk. Top with bacon, cheese, parsley, and then season with salt and pepper. 3.Bake at 350 degrees F for 20-25 minutes, or until the egg whites are set. Serve immediately.